Recipe courtesy of Chef Jeremy Kulers. Preheat oven to 300F. Whisk eggs and sugar in a medium (at least 2 quart) bowl, set aside. In a 2 or 3 quart sauce pot, whisk together the cream and coconut milk over medium-high heat. When it begins to steam and bubble gently around the edges, remove it from the heat. While whisking the egg mixture, pour in half of the cream mixture. Continue whisking for about 10 seconds, and, while still whisking, pour in the remainder. Strain the custard mix through a fine mesh strainer into a clean bowl. Whisk in the coconut extract (and shredded coconut; optional). 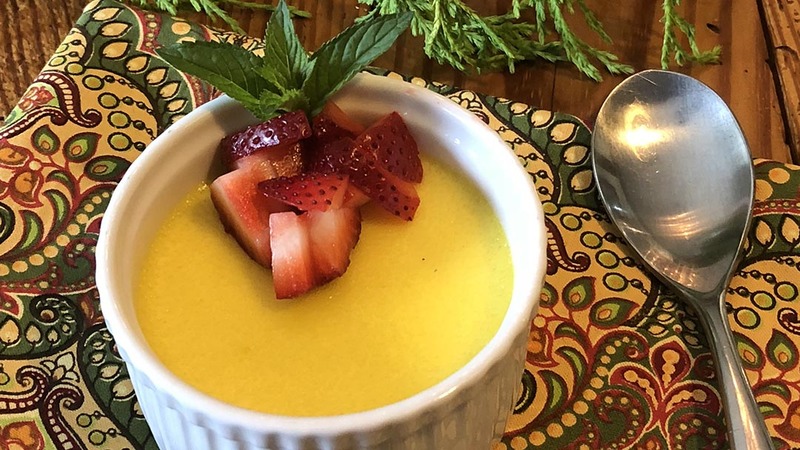 Pour custard mix into a clean pitcher, and divide evenly among eight 4-ounce ramekins, placed in to heavy duty roasting pans or braziers. Fill the pan or brazier with hot (about 140F) water halfway to two-thirds up the side of the filled ramekins. Place the custards into the oven. Check after 30 minutes, and every 10 minutes thereafter. The custards are done when the outside is set, but the center jiggles when shaken gently. Remove the roasting pan from the oven, but allow the custards to stand in the water bath until mostly cooled. Transfer custards to a sheet tray, cover, and refrigerate overnight (or at least until thoroughly chilled).